Mt Shasta Above Red Banks is a very special part of the climb. You can now see down the north side of the mountain, and the views of the glaciers and terrain just above you is spectacular. The climb from Lake Helen to the top of Red Banks, is considered the crux of the Mt Shasta Climb on the Avalanche Gulch Route. You are now standing at 12,820 feet, and have gained around 2,400 feet of elevation since you left Lake Helen. Not bad for an early mornings work. With the summit not far off, excitement begins to grow. In the top photo, you see climbers eating breakfast at around 6 AM in the morning just at the top of Red Banks. When the weather is clear, this is a gorgeous time of day, and it is scenes like the one above and the others below that keep me excited about climbing mountains. The climbers above are resting on the top edge of the Konwakiton Glacier. As the year wears on, warmer temperatures melt the snow and ice on the glaciers edge, and a large crevasse known as a bergschrund opens up. Climbers then must bypass this obstacle by climbing through one of Red Banks chimneys further to the northeast (when coming from below) rather than heading for the notch next to "The Thumb" The summit at 14,179 feet above sea level is still 1,359 vertical feet away, and this last bit of elevation gain can be painful. Note the arrows pointing to the tiny little figures approaching the top of Misery Hill to the right. It gives you a good idea of the shear scale of Mt Shasta. Misery Hill is well named, because at that point most climbers are truly miserable after working up the steep snow and ice slopes of the mountain all through the night and early morning hours. When I look up at scenes of tiny little climbers far up the slope, I give a big sigh, because I know I have to eventually get up there. This is where most people (including myself) have to begin pushing themselves mentally. You are tired from the previous day and early morning work and the thin air of high altitude has begun to take its toll. 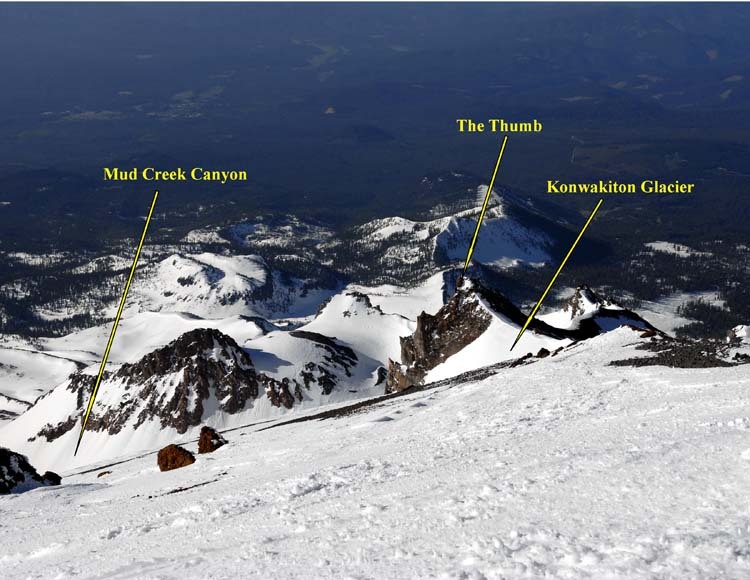 Mt Shasta has seven glaciers on its northern flanks. Their names are Bolam, Hotlum, Konwakiton, Mud Creek, Watkins, Whitney and Wintun. 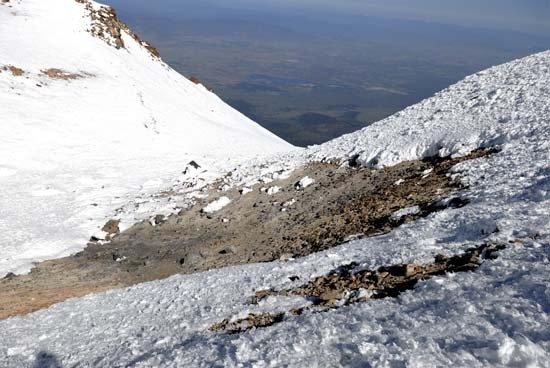 In 2002, scientists made the first detailed survey of Mount Shasta's glaciers in 50 years. They found that seven of the glaciers have grown over the period 1951-2002, with the Hotlum and Wintun Glaciers nearly doubling, the Bolam Glacier increasing by half, and the Whitney and Konwakiton Glaciers growing by a third. In the photo to the left, you see a view from the top of Misery Hill. 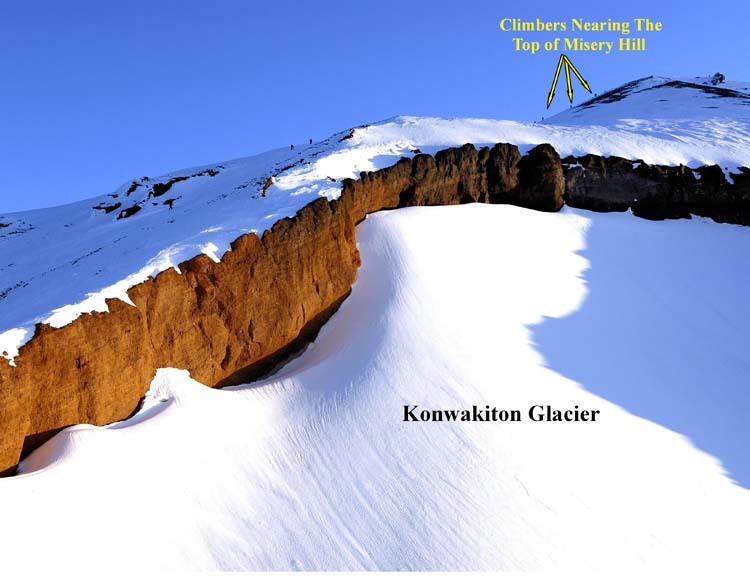 The very top page photo shows climbers right about at the elevation of "The Thumb" and now it looks like a little ant hill from the top of Misery Hill. The top of Red Banks is where I see more people turn around and go back down than at any other part of the mountain. A few possible reasons for this are as follows. Some folks have started up the mountain too late and there is not enough time to summit before nightfall. Others have become altitude sick and aspirin or other forms of analgesics just don't cut the mustard any more. Exhaustion has set in due to the extreme hard work that it has taken to get up the mountain (remember you still need to get back down). These are some very good reasons for turning around and here are a couple more. Dangerous conditions have developed, such as deteriorating weather, or unstable snow and ice activity (avalanche danger, etc), terrain has become more difficult and going on would require climbing into areas that would exceeds ones abilities. Remember, no mountain is worth your life, and you can always come back another day. Once on top of Misery Hill and over the ridge, Shastina comes into view (image to the left). Shastina is the highest satellite cone of Mount Shasta. At the top of Misery Hill, you are well above Shastina which stands at 12,330 feet. Shastina is taller than Mount Adams and would rank as the third highest volcano in the Cascades behind Mounts Rainier and Shasta were it not for the fact that it is so closely connected to the main peak. Shastina rises over 450 above the saddle that dips between itself and the main summit of Shasta. In the Sierra Nevada, some of the 14,000 foot peaks are given there own spot on the map as independent summits, even though they have less reason to do so then Shastina. 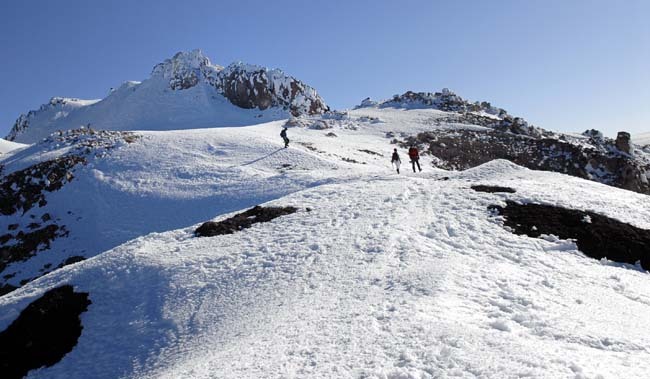 It easily exceeds the typical mountaineering standard of 300 ft for a peak to qualify as an independent summit, yet most lists of Cascade Volcanoes omit it nonetheless. Nearly there as I stop to catch my breath. The summit has come into full view in the background, and all we have to do is traverse the slightly rising slope of hard packed snow and ice. Then comes the last couple of hundred feet of elevation gain to reach the top. These frozen sections above Red Banks are my favorite part of the whole climb up Mt Shasta. The early morning light is great for photography and the views are spectacular. Up here you get a real since of alpine adventure. Here is where I get my second wind, for there is nothing like seeing your goal close at hand. 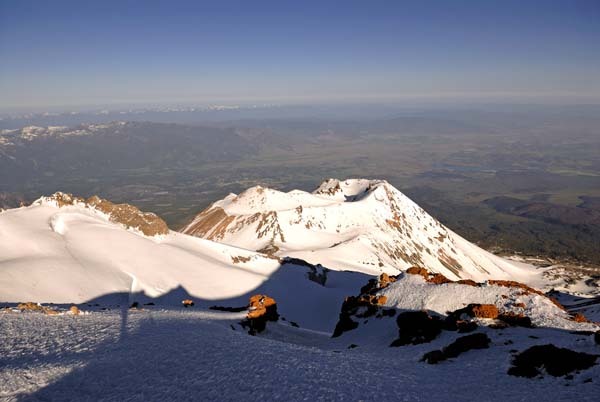 Proper Conditioning is vital when it comes to any type of demanding physical activity such as Mountaineering, but as stated above, nearly everyone who takes on a mountain like Mt Shasta ends up having to push themselves mentally at one point of another in order to reach the top. Very close to the summit, you see a patch of open ground (photo to the left). This is the location of Mt Shasta's fumaroles. Boiling pots of sulfur and other odorous gases serve as a reminder that Mt Shasta is still an active volcano and merely napping. On one fateful climb, John Muir and his climbing companions were pinned down here during a ferocious storm. The following is an account of his night spent laying alongside these hot vents. He latter credited these boiling fumaroles to saving his life. "The night wind rushed in wild uproar across the shattered cliffs, piercing us through and through, and causing violent convulsive shivering, while those portions of our bodies in contact with the hot lava were being broiled. When the heat became unendurable, we scraped snow and bits of trachyte beneath us, or shifted from place to place by shoving an inch or two at a time with heels and elbows; for to stand erect in blank exposure to the wind seemed like certain death." "The acrid incrustations sublimed from the escaping gases frequently gave way, opening new vents, over which we were scalded; and fearing that if at any time the wind should fall, carbonic acid, which usually forms so considerable a portion of the gaseous exhalations of volcanoes, might collect in sufficient quantities to cause sleep and death, I warned Jerome against forgetting himself for a single moment." Hope you enjoyed reading about Mt Shasta Above Red Banks. For much more on Mt Shasta, please click on the link below to quickly get back to the top of this page and click on one of the other side links on Mt Shasta for more adventure!